Microsoft LifeCam is a wired, desktop webcam that delivers High Definition still (1.3 megapixels interpolated) photography, brilliant video (640×480 pixels) and a built-in unidirectional noise-canceling microphone for crystal-clear audio performance from Microsoft. LifeCam has 2 modals that’s VX-3000 and VX-6000 which adds high definition video capabilities, a wide angle lens, a 3x digital zoom, and a high-speed USB connection. Other features of Microsoft LifeCam VX-3000 include optimized for and integration with Windows Live Messenger where there is Windows Live Call Button, LifeCam Dashboard on Windows Live Messenger window and ability to One-Touch Blogging with Windows Live Spaces. LifeCam VX-3000 also has automatic face tracking software and universal attachment base to fit itself on most monitors include LCD flat panel. ABC News (dead link) reviews Microsoft LifeCam VX-3000 webcam and concludes that the LifeCam VX-3000 is a relatively inexpensive webcam with a good set of features. If not for its lackluster mic and so-so video quality, it would be a great low-cost choice. Just like the company’s high-end VX-6000 but a little less capable, the VX-3000 is really an entry-level camera that packs a few fancy features. ComputerAct!ve (dead link) concludes with rating of 3 out of 5 that Microsoft’s LifeCam VX-3000 is easy to use and has a few useful added features, but weak performance means that it’s a fairly average webcam at a reasonably affordable price. 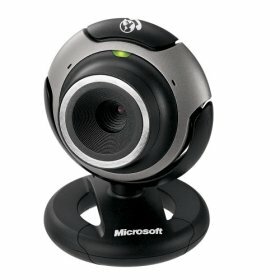 Note: Higher-end Microsoft LifeCam VX-6000 is also available.